Develop short passing and receiving technique. Play starts with one player on each of the orange cones, all other players line up on blue cone. 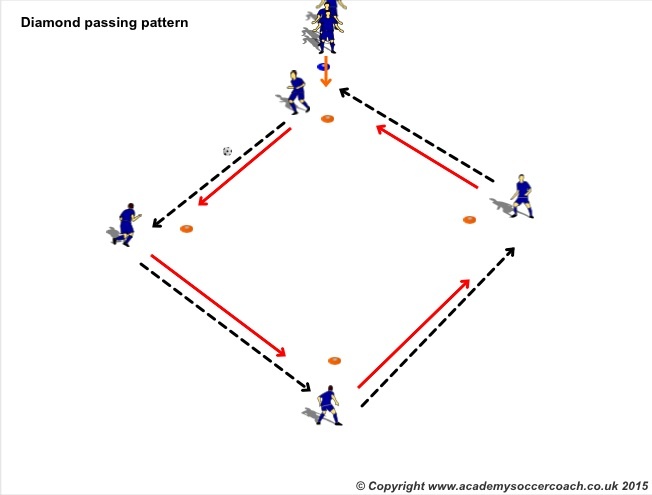 First player must play anti-clockwise to the player on the next cone and follow his pass. This is repeated until the final cone where this player will dribble to the back of the line. To progress, go clockwise and work on receiving and passing with the opposite foot. Focus on good passing technique with push pass, movement to receive, receiving on the back foot to play forward and communication. 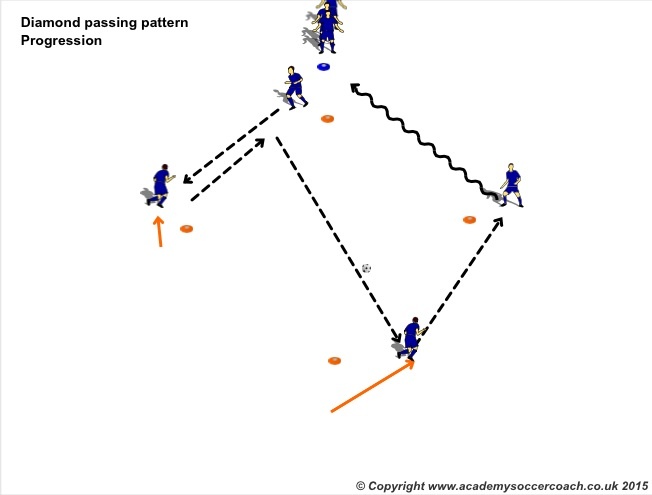 Quick passing combinations – Server plays a 1-2 with next player then plays a long pass to the opposite player who plays a short pass to the final player. Final player dribbles back to start. Short, quick passes then a long pass. How can this be related to a game? Quick combinations to play out from the back. Add four large cones around the diamond from previous activity and lift diamond cones. 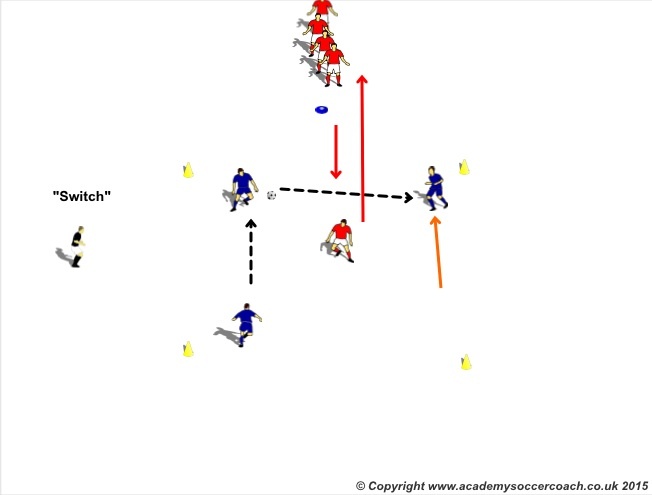 Start with 3 players in the square with other players on blue cone, first player runs in and acts as defender. Coach calls switch every 30-40 seconds to change the defender while the three players try to keep possession. Players split into two teams with one goal keeper and a neutral overload player. To begin play 3v3 with rest of players outside the grid waiting to be substituted in or have two activities going. Ball is played out by goalkeeper to his team who must score in one of the target goals. If the defending team win the ball they can score in main goal. Encourage starting team to keep possession using extra player and goal keeper. Substitute players every 2/3 times and swap roles after 8-10mins.